Chapter 13: Out of Our Depths From Steven Pinkers The Blank Slate By Liz Beck, Erica Olsen and Joe Legacy. 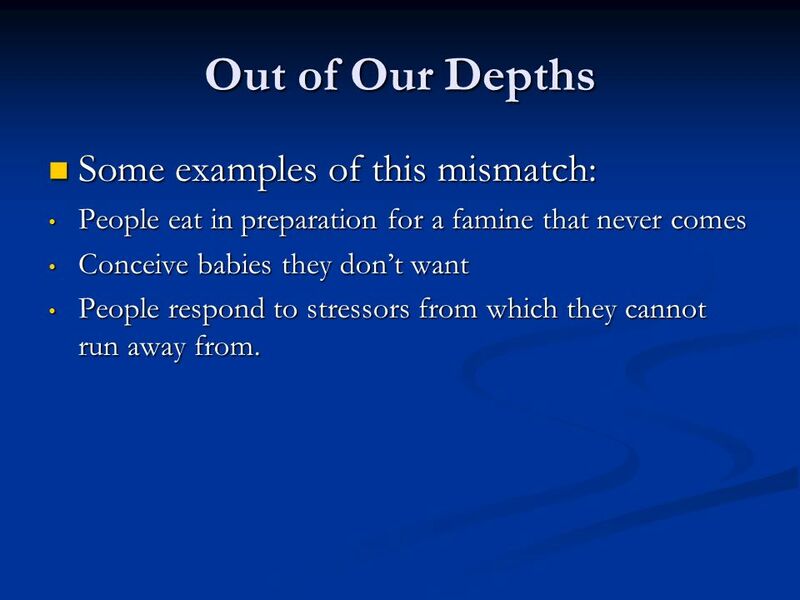 3 Out of Our Depths Some examples of this mismatch: Some examples of this mismatch: People eat in preparation for a famine that never comes People eat in preparation for a famine that never comes Conceive babies they dont want Conceive babies they dont want People respond to stressors from which they cannot run away from. People respond to stressors from which they cannot run away from. 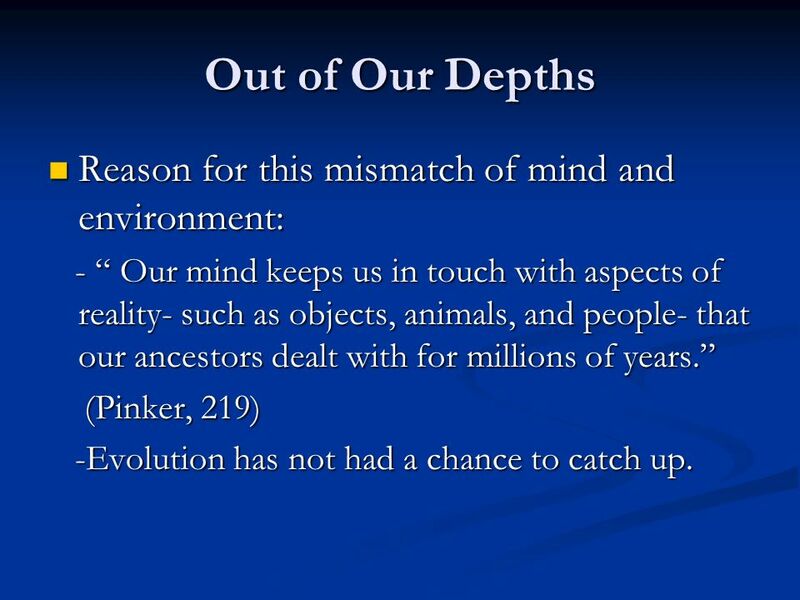 4 Out of Our Depths Reason for this mismatch of mind and environment: Reason for this mismatch of mind and environment: - Our mind keeps us in touch with aspects of reality- such as objects, animals, and people- that our ancestors dealt with for millions of years. - Our mind keeps us in touch with aspects of reality- such as objects, animals, and people- that our ancestors dealt with for millions of years. (Pinker, 219) (Pinker, 219) -Evolution has not had a chance to catch up. -Evolution has not had a chance to catch up. 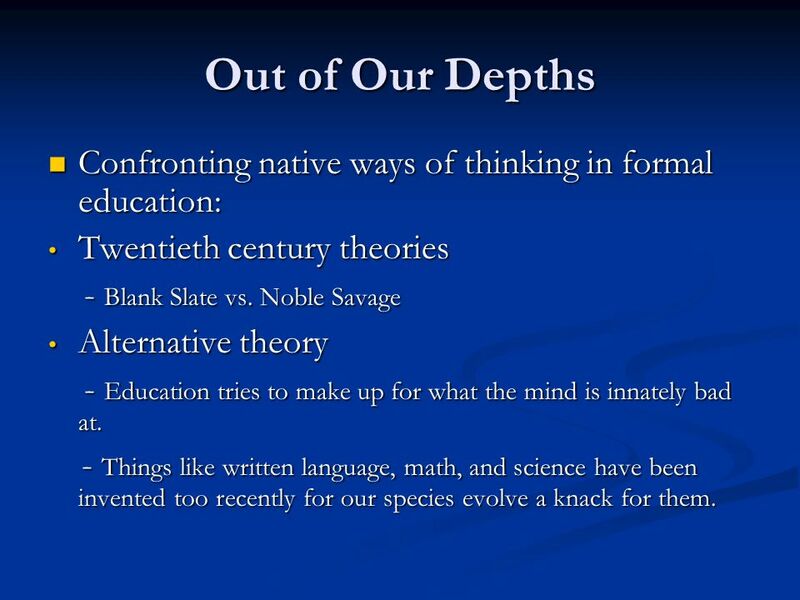 5 Out of Our Depths Confronting native ways of thinking in formal education: Confronting native ways of thinking in formal education: Twentieth century theories Twentieth century theories - Blank Slate vs. Noble Savage - Blank Slate vs. Noble Savage Alternative theory Alternative theory - Education tries to make up for what the mind is innately bad at. - Education tries to make up for what the mind is innately bad at. - Things like written language, math, and science have been invented too recently for our species evolve a knack for them. - Things like written language, math, and science have been invented too recently for our species evolve a knack for them. 6 Out of Our Depths Genetically modified foods Genetically modified foods Facts: Facts: Different varieties have been eaten in the U.S with out any harm. Different varieties have been eaten in the U.S with out any harm. 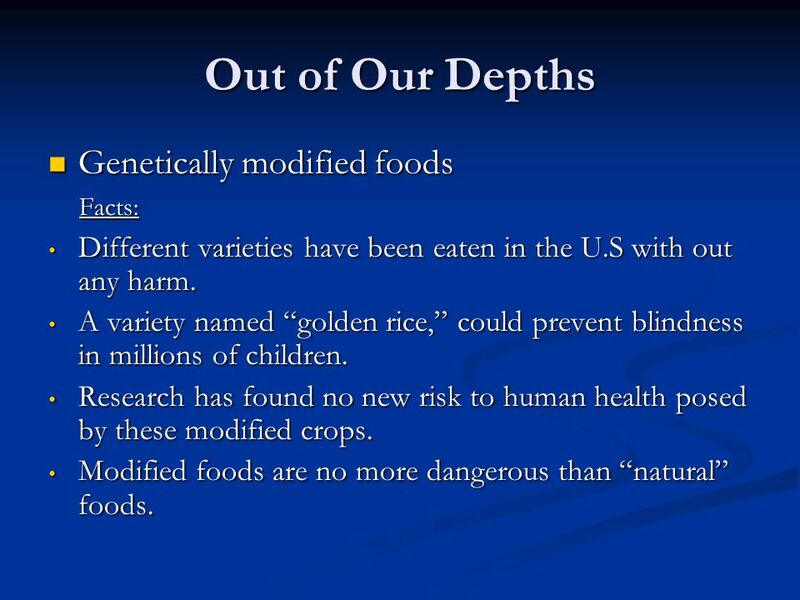 A variety named golden rice, could prevent blindness in millions of children. A variety named golden rice, could prevent blindness in millions of children. Research has found no new risk to human health posed by these modified crops. Research has found no new risk to human health posed by these modified crops. Modified foods are no more dangerous than natural foods. Modified foods are no more dangerous than natural foods. 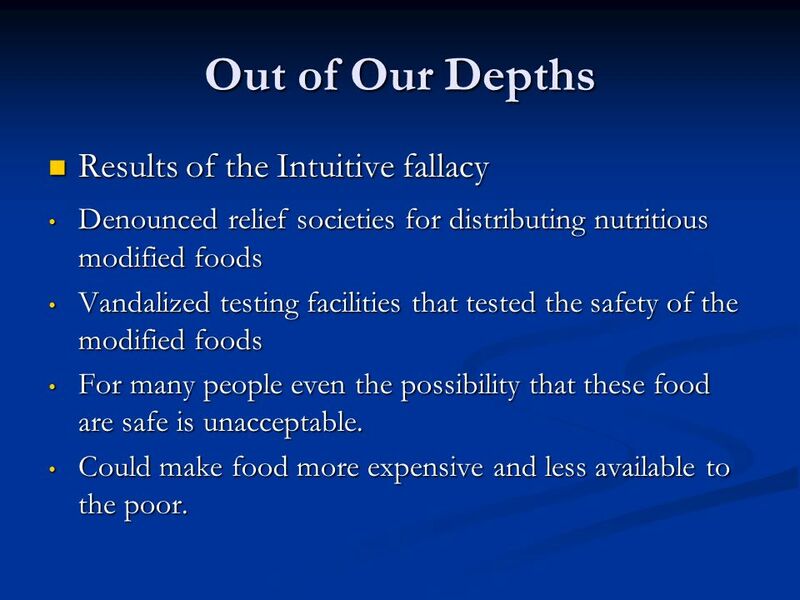 7 Out of Our Depths Results of the Intuitive fallacy Results of the Intuitive fallacy Denounced relief societies for distributing nutritious modified foods Denounced relief societies for distributing nutritious modified foods Vandalized testing facilities that tested the safety of the modified foods Vandalized testing facilities that tested the safety of the modified foods For many people even the possibility that these food are safe is unacceptable. For many people even the possibility that these food are safe is unacceptable. Could make food more expensive and less available to the poor. Could make food more expensive and less available to the poor. 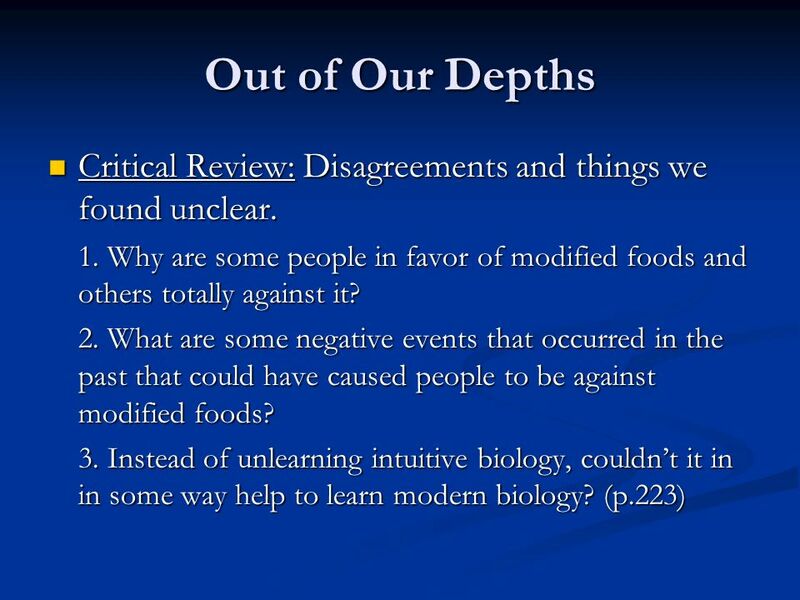 8 Out of Our Depths Critical Review: Things we agree with and found interesting. Critical Review: Things we agree with and found interesting. 1. 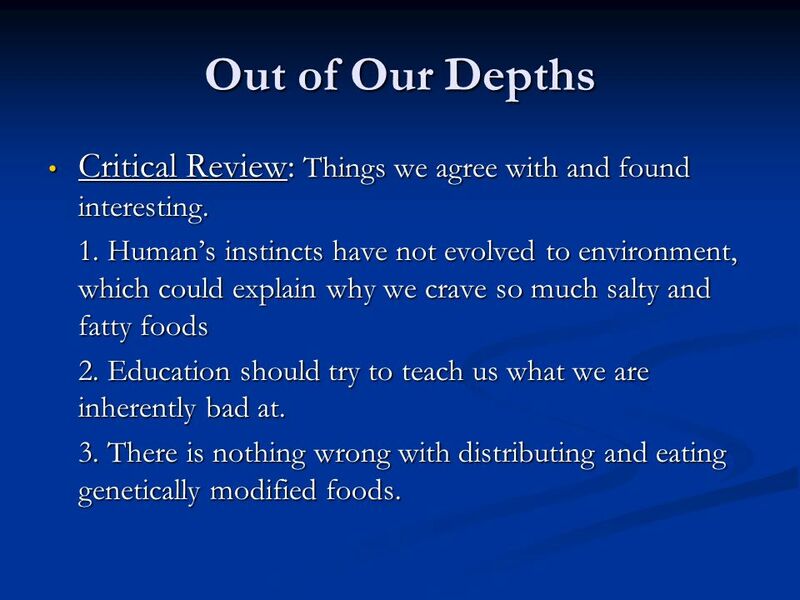 Humans instincts have not evolved to environment, which could explain why we crave so much salty and fatty foods 2. Education should try to teach us what we are inherently bad at. 3. There is nothing wrong with distributing and eating genetically modified foods. 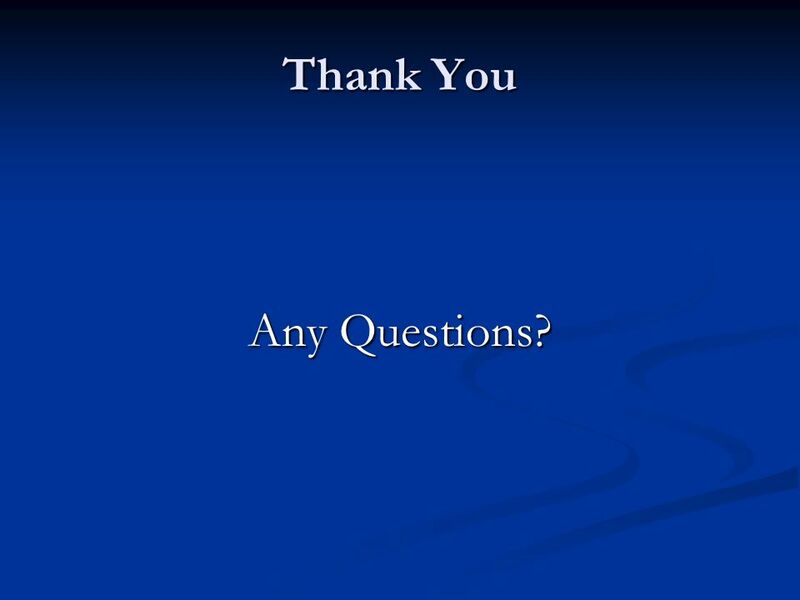 10 Thank You Any Questions? 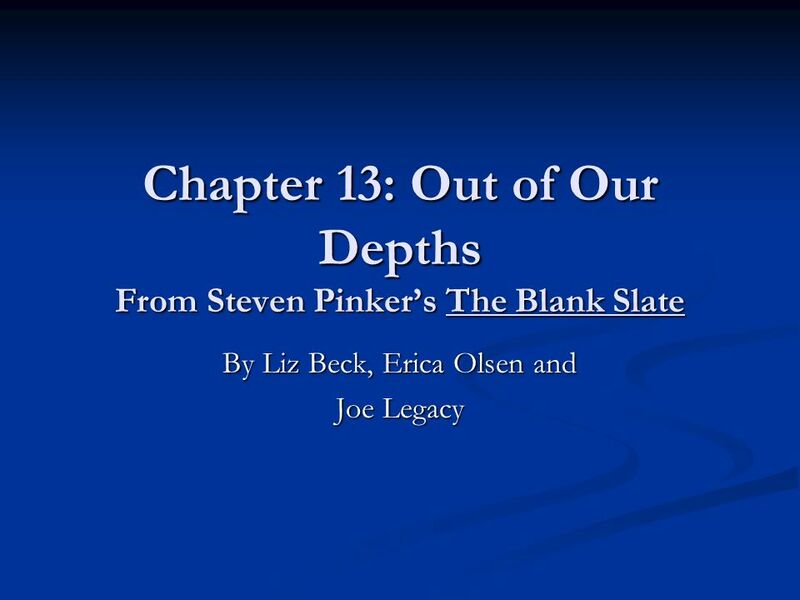 Download ppt "Chapter 13: Out of Our Depths From Steven Pinkers The Blank Slate By Liz Beck, Erica Olsen and Joe Legacy." Theories and Evolution Put your Post-Lab questions in your group folder. Catalyst: How does speciation (one species splitting into two) occur? When you. Theories and Evolution Catalyst: How does macroevolution/speciation occur? When you hear the word theory, what do you think? What are the two criteria. Unit 1 - Introduction “bios” – life, living things, “logy” – the study of Biology - the study of life Major branches of biology: Zoology – the study of. Authors: Mia Perković and Berenice Schwartz, Slovenia. 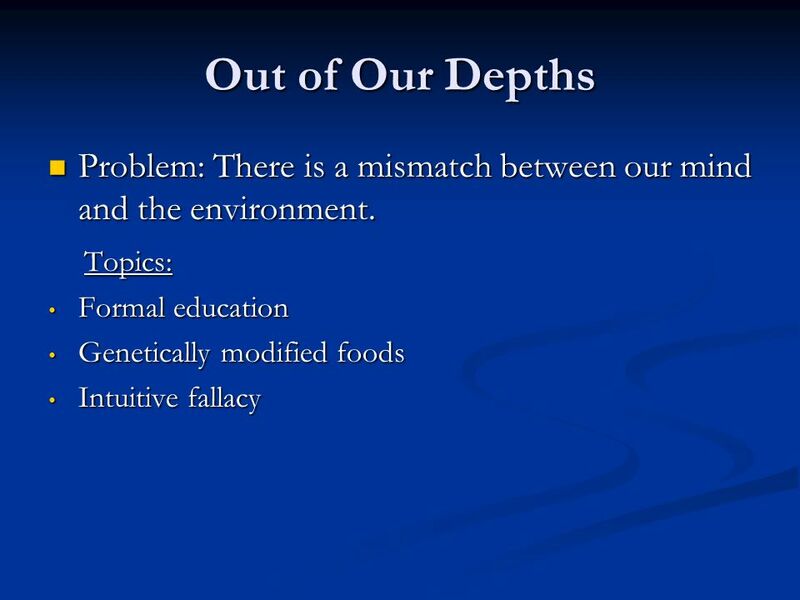 THE DEBATE ABOUT GENETICALLY MODIFIED FOOD. WHAT IS GM FOOD? GM food is made with ingredients such as soya or maize, with genes from other plants or animals. How well do ‘facts’ travel? a Leverhulme/ESRC project at the department of Economic History. Fear of Determinism and Nihilism Liz Beck, Amber Hager, Erica Olsen. + The Food We Eat How much do you really know about the food that you eat and how it is made? Would you ever eat something that was created in a laboratory. Topic 4. Learning objectives: By the end of the lesson you should be able to: Explain the impact of the environment on the phenotype of an organism. Describe. Why Aren’t Animals Human?. Life is primordial; animals are ancient; humans are very recent. 1 Welcome To Rural Sociology 2225 “Science, Technology and Society” Mary Grigsby Associate Professor of Rural Sociology Division of Applied Social Sciences. Science affects Society 1.3. Scientists interact with society Three aspects of scientific work that depend on society: Three aspects of scientific work. Why We Want to Do the Wrong Things. Thesis Humans are often motivated to select harmful or less than ideal actions Many of these poor choices are the. Science and the Environment Chapter 1. Vocabulary Use your books to define the following Key Terms – Environmental science – Ecology – Agriculture – Natural. Food and Agriculture Chapter 15. Chapter 15: Genetic Engineering Ms. Luaces, Honors Biology.